The Toronto Blue Jays today announced that they have signed free agent and Buffalo-native INF JIM NEGRYCH to a minor league contract with an invitation to major league spring training. 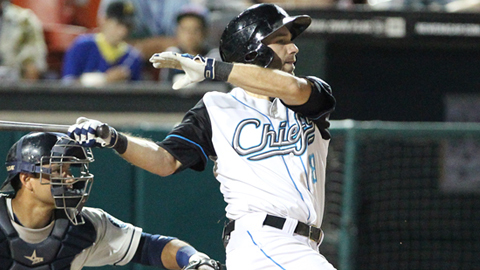 Negrych, a product of St. Francis High School where he was a two-time All-Western New York player, appeared in 91 games with the Triple-A Syracuse Chiefs last season. He averaged .261 (73-264) with nine doubles, a triple, eight home runs and 39RBI. He was named to the International League All-Star Team and went 1-2 in the 25th Annual Triple-A All-Star Game that was played at Coca-Cola Field. Negrych has played eight career professional games at Coca-Cola Field against the Bisons while with the Indianapolis Indians in 2010 and the Chiefs in 2012. He has hit safely in seven of those contests with a .371 (13-35) average, a double, a home run, three RBI and four runs scored. In his Coca-Cola Field debut on June 17, 2010, Negrych singled in his first at-bat and then hit a two-run home run off Bisons starter Pat Misch in his third at-bat for the only runs in a 2-0 Indians victory over the Herd.